We had two journalists visiting last year. Julia Shipley from Seven Days participated in the August Pride and Prejudice weekend and wrote a lovely piece for their State of the Arts section which you can view online here. And Melanie Stetson Freeman, a staff photographer from The Christian Science Monitor, joined us on Saturday of the In Character weekend to snap pictures for her photo piece in their September 18th magazine and you can view the online version here. To receive notification of future Jane Austen weekends by email please click here. 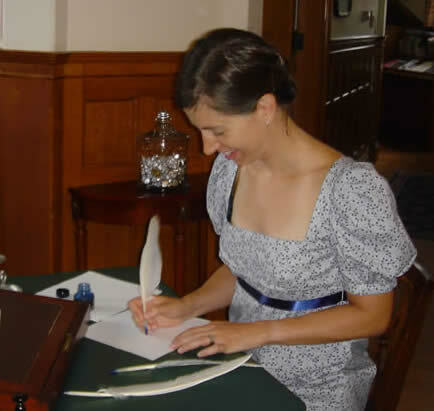 Please inquire about the special rate for book groups, families, or others who may reserve a Jane Austen weekend on dates other than those regularly scheduled as availability permits and may choose which novel will be the theme. A leisurely weekend of literary-inspired diversions has something for every Jane Austen devoteé. Imagine a literary retreat that will slip you quietly back into Regency England in a beautiful old mansion where Jane herself would feel at home. Take afternoon tea and find out why Jane Austen never did so. Listen to Mozart. Bring your needlework. 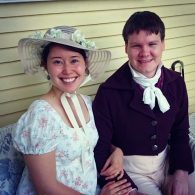 Share your thoughts at a book discussion of Persuasion, Pride and Prejudice, Sense and Sensibility or Emma and how the movies stand up to the books. Attend the talk about the time of Jane Austen. Test your knowledge of Jane Austen, her books, and the Regency period and possibly take home a prize. Take a carriage or sleigh ride. For the gentleman there are riding and fly fishing as well as lots of more modern diversions if a whole weekend of Jane is not his cup of tea. Join every activity or simply indulge yourself quietly all weekend watching the movies. Dress in whichever century suits you. Just imagine the interesting conversation with a whole houseful of Jane’s readers under one roof. Weekend guests have commented that they wish there had been a tape recorder under the dinner table so they could replay the evening again and again. It won’t just be good company; it will be the “company of clever well-informed people who have a great deal of conversation”. It will be the best! It’s not Bath, but it is Hyde Park and you’ll love Vermont circa 1800. 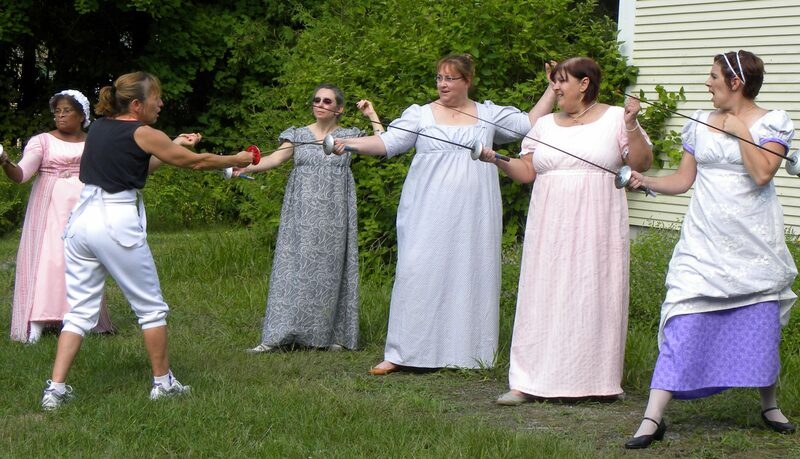 Click on the Innkeeper’s Blog to see some photos from the 2013 “in character” weekend. 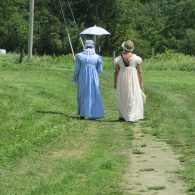 Another Jane Austen “in character” weekend will be scheduled for August 2019. 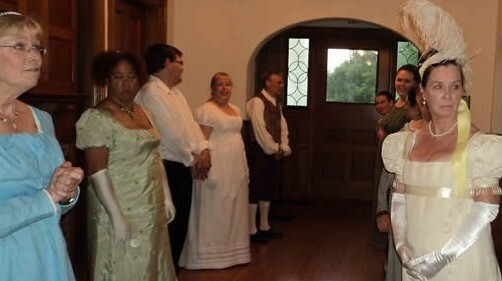 Each guest will choose to be a character from any one of Austen’s novels. Period dress is optional, but guests will interact in character throughout the weekend. The activities will depend somewhat on the weather and participant interest, but may include a Regency dinner party, an evening of games, letter writing, fencing, English Country dancing, crewel embroidery, tatting, rolled paper decoration, a game of croquet, a very long walk, riding (side-saddle and astride), carriage driving, archery, playing whist, and a picnic with or without Colonel Brandon. Weekend rates are $465.00 for singles, $425.00 per person double, and $395.00 per person triple plus 9% tax and there is an additional charge to participate in some activities. Now’s your chance to be Elizabeth Bennet, Anne Elliot, Mr Knightly, or even Lady Catherine, but only one of each character may sign up so make haste to confirm your reservation. Bring your own Darcy or perhaps you’ll meet him on the croquet lawn. Perhaps the door to the romance of Jane’s world isn’t in Hammersmith after all. 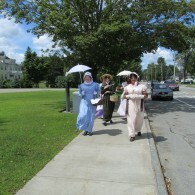 Jane Austen Weekend rates start at $445.00 for singles, $415.00 per person for doubles, $395.00 per person for triples, and include two nights’ lodging, Friday evening’s talk over dessert and coffee, full breakfast on Saturday morning, Saturday afternoon tea, Saturday dinner and book discussion, early Sunday Continental breakfast, and the Jane Austen quiz during Sunday brunch. Add any weekdays immediately before and/or after a Jane Austen weekend and get the room for half the regular rate. 9% Vermont tax is additional. The usual cancellation policy applies. Letter writing with a quill pen. Please inquire about the special rate for book groups which may also reserve a Jane Austen weekend on dates other than those regularly scheduled as availability permits. 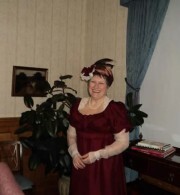 Some useful links for information about the Regency period or dress for the occasion. Please call or write for more information and book directly with the inn at 866-800-6888 or info@OneHundredMain.com.